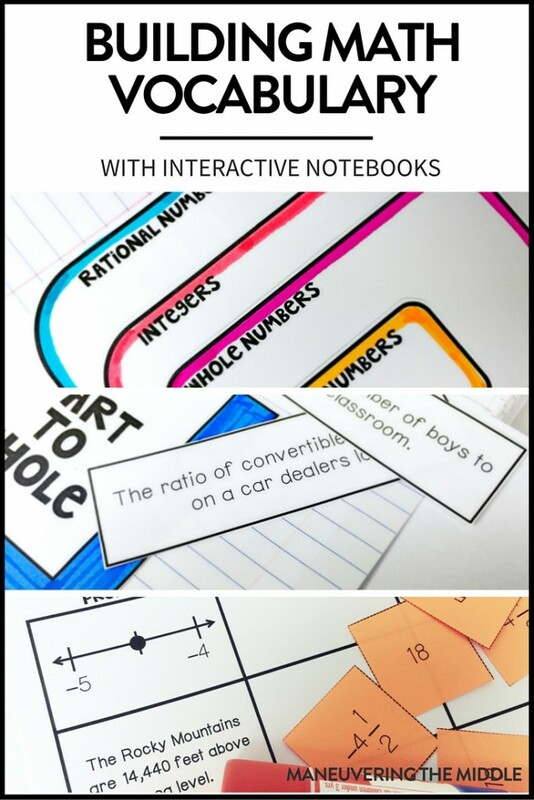 Math interactive notebooks are a great hands-on tool to engage students in the content and process. 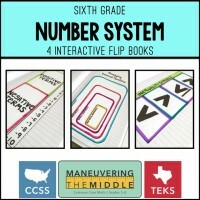 It has been noted by researchers that interactive notebooks allow students to systematically organize information. Typically the right side of the notebook is teacher guided note taking, often in the form of a graphic organizer, foldable, or cut and paste. The left side of the notebook is where students are able to process the information through practice, drawings, and reflection. Math academic vocabulary is conceptual. Students not only have to know what “rate of change” means, but they have to do something based on the term or phrase. Most mathematical terms have lengthy and complex definitions that are difficult to interpret and apply for a middle school student. 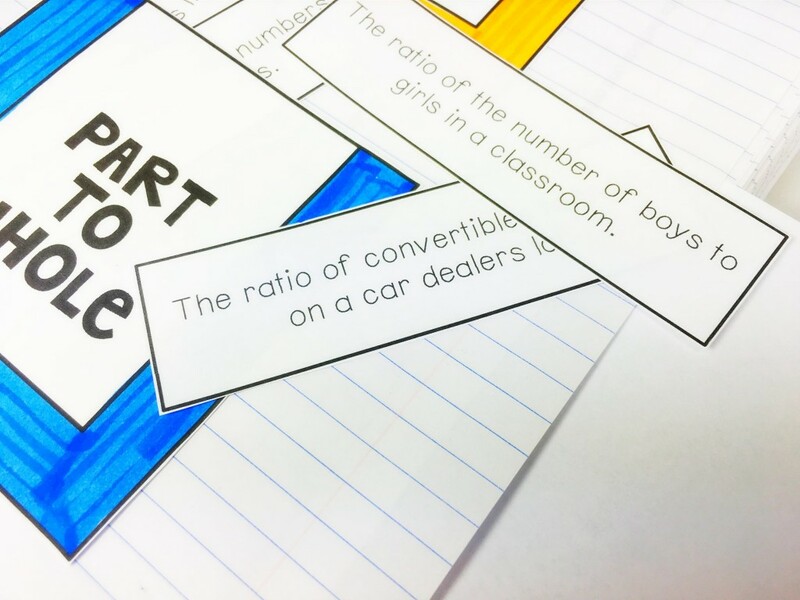 Students who are able to read a problem and quickly identify the terms and corresponding process are much more successful with solving the actual math content. 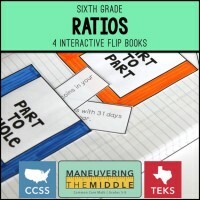 Math interactive notebooks provide a place to interact with the vocabulary and a space to reference at a later time. My first year teaching, I had students create a glossary in the back of their interactive notebook. Students would write the definition and draw a picture of some sort. While this was a step in the right direction, it really didn’t allow students to interact. It was more a rote experience that took up precious time. Later, I decided to incorporate vocabulary into the class with specific activities. Below are three different ways for students to interact with the vocabulary using their interactive notebooks. The pocket word sort is perfect for differentiating between common terms. In the example below, students are reading a statement and determining which are “part to whole” ratios and which are “part to part” ratios. This skill is foundational for solving proportions and percent application. 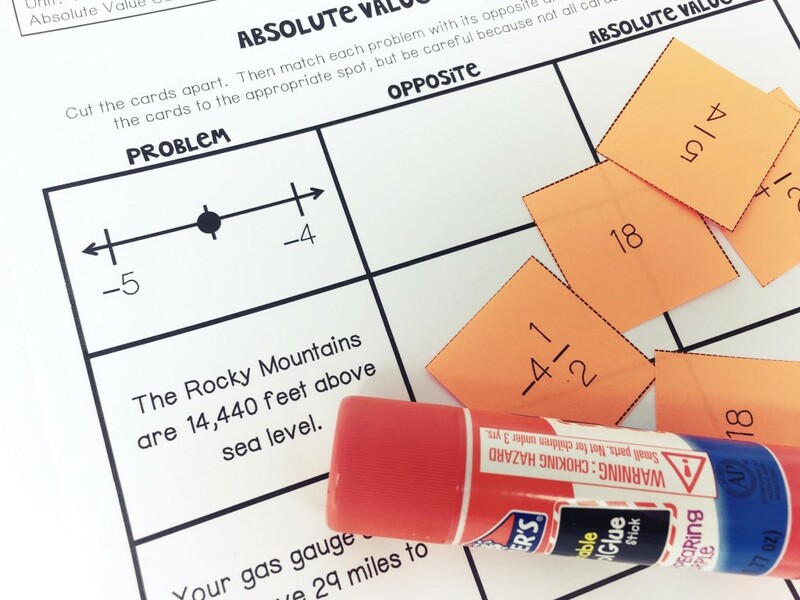 This is one of my favorite, go-to activities for math interactive notebooks. 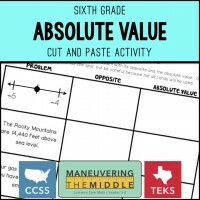 Students are working with absolute value, which is often confused with the opposite. Here students are given a problem, then asked to find the absolute value and the opposite of the problem. This specifically addresses the misconception that they are one in the same. I think this activity lends itself to slope quite nicely, as well. It is embarrassing to admit, but it wasn’t until college that I really understood the number system. I think it was all the terms “rational, irrational, real, integer” that through me for a loop. It all seemed so abstract, and while I am sure that someone taught we these terms, it got to the point in high school math where it is assumed that you know them. I wouldn’t be shocked if the average person or student couldn’t explain a rational number. Various classification structures (venn diagrams, tables, concentric circles) are excellent for teaching the differences between the terms and how they apply. Based on the activity, students are able to converse with peers about the vocabulary, practice using it in context, and summarize their learning. First and foremost this is going to benefit the English Language Learners in your classroom. They will get hands-on experience with the vocabulary and feedback from both peers and the teacher. Additionally, this is will support students who struggle with math content in general. Because of the interaction with the text, they will be moving their learning from short term memory to long term memory using summarization. I am a huge fan of summarization after being training through AVID. 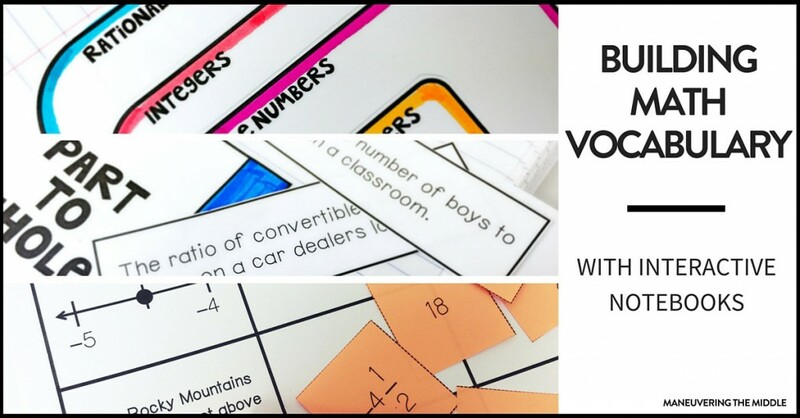 What other ways do you incorporate vocabulary in your math class? When you started interactive notebooks did you find a good resource to pull from or create things on your own? I mostly created them on my own. They don’t have to be fancy. Sometimes, I would even just have the students use markers to write on them instead of taking the time to make them on the computer. 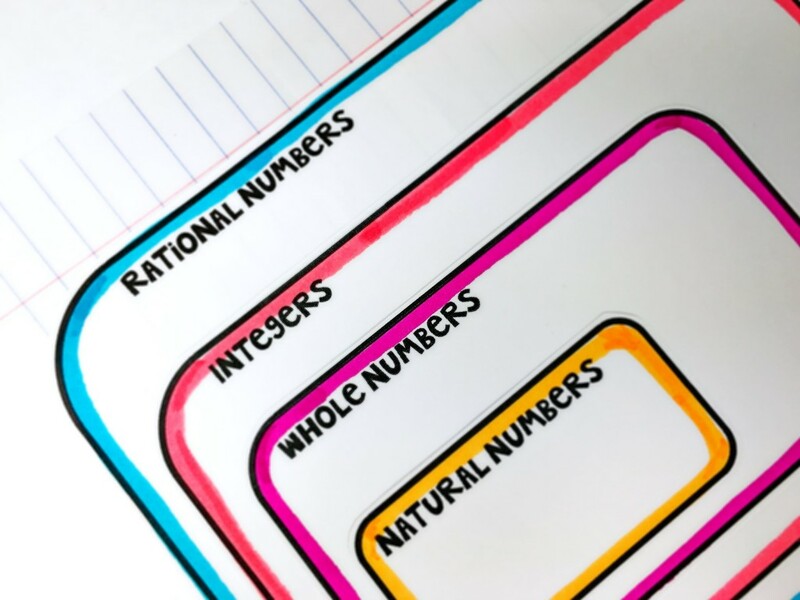 I know you asked this question a year ago, but Sarah at Mathequalslove has an incredible resource of her interactive notebook templates. She teaches high school, but many of her pages can be used at the middle school level as well. Hope that helps! I noticed that most lessons in the curriculums do not have interactive notebook pages. Will you be adding some for each lesson in the future?